I have a failed siew mai making project recently. The taste of the minced pork with prawns is good. However, the skin remains dry and unimpressive even after I have steamed the siew mai for a long time. This is the siew mai before steaming. I put a tiny piece of salted duck eggs on top. The skin I used is the frozen wantan skin. For variety, I also used century egg to give it a black dot. Eventhough the siew mai looks not too bad and taste good, the skin is too dry. For the second batch, I wipe the moisten the skin with some water and yet, they turned out as dry. This is the ‘mimic-king professional food photographer’, classic Chinese dish food photo. Can you see the flour still looking dry in the middle siew mai? This plate has been steamed for a long time and yet, the skin doesn’t seem to absorb some water to make it softer. The other thing is the siew mai I made does not ooze oil and therefore, doesn’t taste as good those sold by dim sum shops. Sigh…anyone knows why the skin is dry? Try applying moisturizer! LOL! ;p No idea on the dry skin part but kudos for the effort! Maybe you can freeze your meat with a little water (the way they make siew long pau) that way the water will escape from the meat when you steam and moisten the skin? .. just guess though. hi, I’ve never made siew mai before, so obviously not an expert, but could it be that your pork is too lean? I think the normal ratio is 2:1 lean ground pork to fatty pork. That’s probably why it’s not oozing oil when you bite into it either. That’s weird… when I steam mine, I always struggle with the timing because just one minute more in the steamer makes it really soggy! Maybe the steamer lid is not tight enough? no idea… hehe, but perhaps “rinsing” the skin in some water before wrapping the filling? 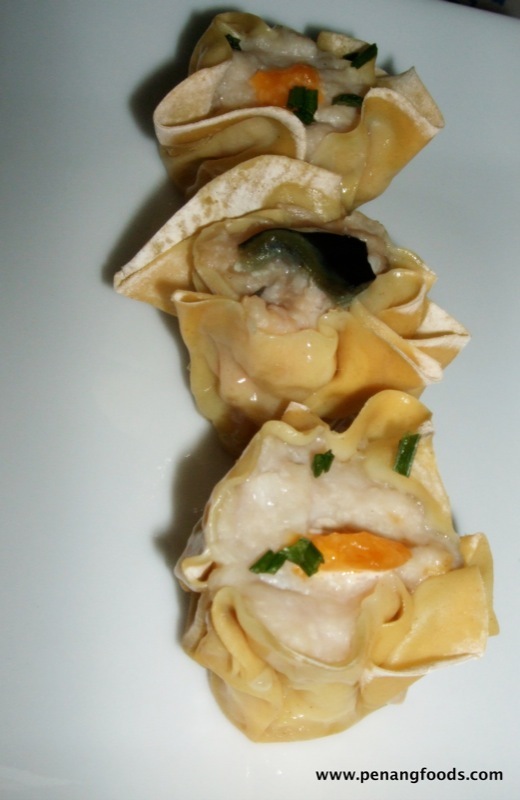 Can you publish your recipe for the siu mai? I don’t really know what goes into your filling. That can be a factor. However, based on the look of your wanton wrapper, you may want to make sure you defrost the wrapper completely before wrapping. Try to mist the wrapped siu mai with water (use a water bottle spray) right before steaming them. Hope that helps! 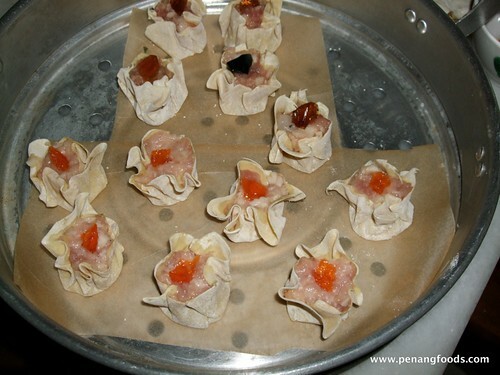 Hey lilian,i may not know the exact cause for the driedness, but my version of siu mai was i only used prawn, no pork. I remember i chopped the prawn into smaller bits and then i add in shredded carrots and mushroom (diced). Besides i add in “hsio shing cooking wine” and soy sauce (to enhance siu mai filling flavor) into the prawn paste too. So i guess its because of the moist from carrots, mushrooms and a dash of soy sauce and cooking wine that i add into the siumai filling, will be absorb by the wonton skin, so tht’s why my version of siu mai skin was moist and not dried. Do give it a try ya lilian! Hey lilian, i also notice there is to much flour on your wonton/ siu mai skin. Do try to reduce it, b’cos i remember some of the wonton/siu mai skin that i did that was dash with too much flour while i was wraping it , turn out that the flour will still remain on the skin even after i had steam it. Then i more thing, i guess its better to put siu mai onto metal plate while steaming the siu mai. B’cos when you steam your siu mai on pieces of paper ( just like you did) , it end up absorbing more moist from the siu mai. Hope my humble comment will help you! Gambateh! advise from the chef, i think because you steam it for too long, thats why its dry , for a 30g filling with wonton skin , 4 minutes is ample, and steam when its “steam” ready. dont start off cold. plus kaling, dont steam dim sum on plate because when the steaming process, the base of dim sum will absorb the water srounds it, this is why they invented dim sum basket, instead of absorbing, the steam rotates in a circle avaoiding sogginess and spped up the cooking process. When my sifu taught me he used fresh wantan skin not frozen ones. When i make mine i usually brush it with oil before steaming and after steaming. A bit unhealthy but the skin is silky smooth afterwards. Or you could trying another wonton skin..heh. I love siew mai and make them at home every now and then. I used minced pork, fresh prawn (chopped), shitake mushroom & a bit of corn flour for filling and bought wanton skin. I usually brush some oil around and on top of each siew mai just before steaming them and they came out alright (not dry). Psst.. try spraying the skin with water before steaming. Make sure they are soaked. Works!! Will 4 minutes be enough for the meat to cook thoroughly? I used fresh wanton skin as well and did not steam on a plate. But I got the same results as lilian. I think the issue is that you might have covered too many of the steamer holes with paper. Try steaming the siumai with cabbage leaves, they’ll allow more steam in. The frozen wonton skin are too thick so use the roller to roll it thiner when the skin defrost before wrapping. Brush the steamer tray with little bit of cooking oil to avoid wonton sticking on the tray. This should solved all your problems. Cheers!!! When I 1st started to make siew mai, I encountered the same problem. 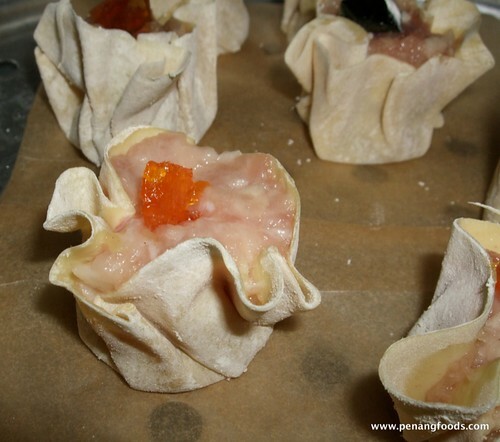 I believe the main reason is because the skin is not in contact with the meat so make sure to trim the square-shaped wanton skin by cutting off the 4 corners to form a nice octagon (8 sided shape) and when you wrap the meat, spread it across most of the skin before shaping the siew mai. Sqeeze it a little so that the meat will overflow slightly to ensure the skin is not over-exposed. (Scrape off excess meat) That way, your skin will not be dry. I do not use paper lining; just spray the steamer with a thin film of oil. Hope it works for you. I don’t know where you are located, or whether you used store-bought wrappers or made your own, but here in US we have to watch out for old stale goods in the stores. Maybe the skins weren’t fresh?? ?